Every year, all across America, college students prepare to compete against one another in a competition hosted by the American Advertising Federation. The Liberty University Advertising Team participated in the 2016 District 3 National Advertising Competition, winning third place in a competition that included 10 other colleges. As a university, the team also took home the most awards from the competition, winning both Best Presenter and Best Plans Book. The competition itself had teams creating a plans book, which outlined a campaign concept for a national brand. The book included a year’s worth of research material, business information and design work. Ad team — From left to right, Tabitha Cassidy, Casey Bell, Jeremy Ng Jia Le, Alexander Doub, Annie Evans, Benton Evans, Adilene Estrada, Katie Clinebell, Sierra Tilley. Tilley, who is an advertising and public relations major, participated in the competition as a practicum. The class is offered in both the fall and spring semesters, but students are encouraged to participate for a full year. Nine students from the School of Communication & Creative Arts formed the team, ranging from those pursuing advertising degrees, to those pursuing graphic design and journalism. Matthew Voss, a senior in advertising and public relations and the president of the Advertising Team, noted the unique experiences this practicum offered. 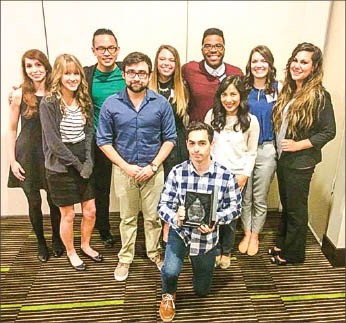 Last year, the Advertising Team took home a sixth-place finish in the competition. Voss discussed how the team operated differently this year and what the team learned from the year-long experience. Moyer is a feature reporter.